Lokad can be seen as an add-on for Brightpearl. We deliver advance inventory forecasting, commerce analytics and pricing optimization. Lokad is an app, like Brightpearl, with a monthly subscription. Brightpearl-powered merchants typically get started with Lokad to optimize their inventory, that is, increase service levels while reducing inventory levels in the same time. Don't hesitate to request a free demo; while we strive to make Lokad as simple as possible, optimizing inventory tends to be inherently complex. The data from Brightpearl can be imported in just a few clicks into Lokad thanks to a native integration that leverages the Brightpearl API (see Brightpearl AppStore). In this page, we details how to make the most of this native Brightpearl integration. The last step will redirect you to your Lokad account and the data connection between your Lokad account and your Brightpearl account will be finalized there. our data retrieval logic is read-only. Your Brigtpearl data will not be modified in any way by Lokad. In the future, if Lokad were to add write capabilities for Brightpearl, we will make it very explicit whenever your are about to change anything within Brightpearl. The custom attributes and the seasons associated to the products. The price lists with the SKU, the price, the min quantity and the name of the list. All data are aggregated per product and per warehouse. Lokad treats as sales orders all the orders retrieved from Brightpearl where the order type code is SO and where the order status is not cancelled, quote or not valid. Lokad treats as purchase orders all the orders retrieved from Brightpearl where the order type code is PO and where the order status is not cancelled, quote or not valid. 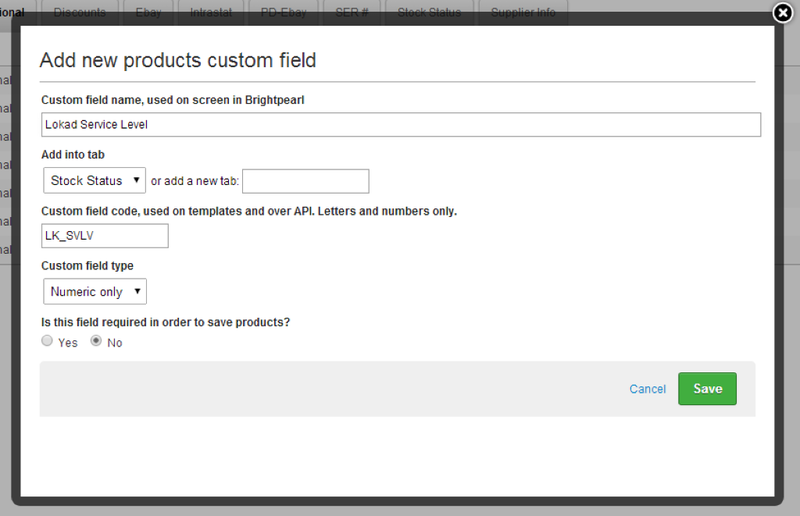 Seasons in Brightpearl are frequently used to flag lists of products as discontinued. By default, Salescast forecasts all the products found in your Brightpearl account - however, it is possible to mark certain seasons not to be forecast. In order to do that, you need to edit your season description and add the keyword Lokad-NoForecast to the description. The keyword can be located anywhere in the description. All the products associated to at least one season marked with Lokad-NoForecast will not be imported into your Lokad account. In order to optimize your inventory, the forecasting engine needs to know the applicable lead time. Whenever possible, Lokad tries to automatically compute the lead time based on the purchase orders; but sometimes there is not enough data, and calculating the lead time is not possible. In order to deal with this situation, Lokad offers the possibility to manually enter the lead time values. In order to keep data properly organized, Lokad offers the possibility to enter those the lead times directly from Brightpearl, by leveraging its custom fields feature. 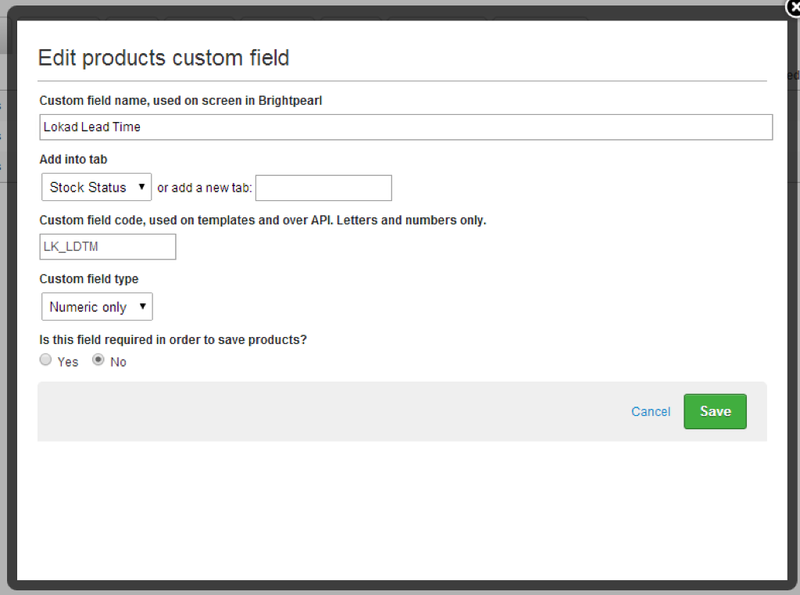 You need to create one field applied to Products and of numeric type. The lead time field should be named LK_LDTM, and configured as outlined below. This field contains the values indicating the total delay for the renewed availability expressed in days. Strictly positive integers are expected for this field. Lokad also offers the possibility to define a default value for the lead time. Hence, you do not need to enter the lead for every single product. If you leave the values blank, then Lokad picks the default values instead. Lokad also offers the possibility to enter service level within Brightpearl. However, with the latest generation of the Lokad forecasting technology, service levels can be automatically optimized by Lokad, which is the recommended approach. Thus, we don't recommend any more to manually adjust the service levels. This section is only kept for archival purposes. The service level is a custom field applied to Products and of numeric type. The service level field should be named LK_SVLV, and configured as outlined below. This field contains the values indicating the probability of not hitting a stock-out. The values should should be between 0 and 100 exclusive. Ex: 95 represents a 95% service level. All products with the stock on hand, the stock on order, the sell price, the buy price. The sales order history with the quantity, the net amount, the tax amount, the client. Those data are pushed into 4 flat files named Lokad_Items.tsv, Lokad_Orders.tsv, Lokad_PurchaseOrders.tsv and Lokad_Prices.tsv within your Lokad account. IsForecasted: boolean flag true or false depending on the Season's setup. Type: the type of the extra setting. Field: the name of the field. Value: the value associated to the field. IsDropship: indicates whether purchase order is expedited directly to the client from the supplier. The price list is denormalized on purpose in order to include the warehouse column. This denormalization facilitates the processing of price lists within Lokad.